If you’re ready to put your tree care company on the path to dominating your market, maximizing your return on investment, and achieving long term success that the competition can’t even handle, you’re in the right place. 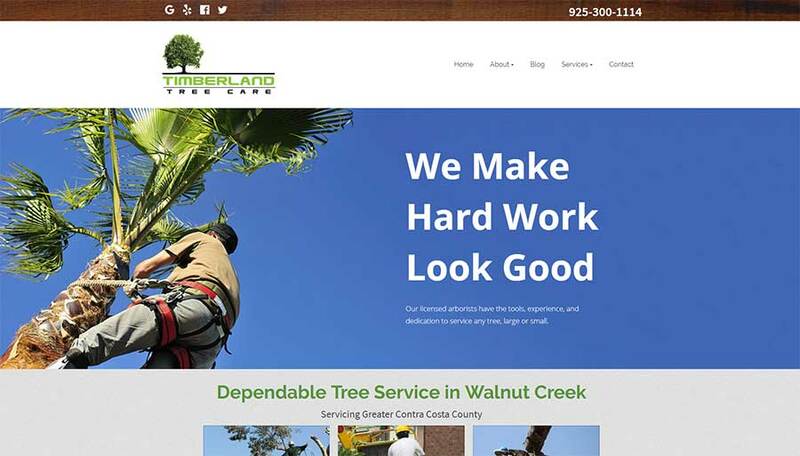 Contractor Calls has helped arborists and tree care companies like Timberland Tree Care dominate their markets with sharp websites, robust marketing plans, and cutting-edge SEO. Ready to learn more? Contact us today to receive a personalized action plan & bid for your business. How Do We Approach Web Design for Tree Care Companies? All of our websites, not just our websites for tree services, are built on WordPress using responsive design standards. In English, that means we can quickly swap in new information (like updated service hours), and your website will instantly be usable across all devices, including phones, tablets, laptops, and desktops. We also make it easy for customers to find any information they need to make the decision to call you, including your hours of operation, service area, licensing, and service policies. If you run a small, hands-on tree care company that gives each customer individual attention, we’ll be happy to build profile pages for your employees to make them more relatable. If you run a large scale tree care company that can handle commercial and emergency work, we’ll feature dramatic photos of your largest jobs and equipment, alongside testimonials from customers who visitors can trust. If your tree care company is the low-cost leader, we’ll build your site around special offers, promotions with high conversion rates, and easy online scheduling that lowers your operational costs. No matter what you’re good at, we’ll make sure your website not only reflects that, but plays a real, active role in it. Since hiring an arborist can be expensive for your average homeowner, we do everything it takes to show them that you’re a company they can trust. Whether that means publishing and syndicating articles to demonstrate your knowledge, finding a local sponsorship opportunity, or just showing off your great reviews, we’re up for the challenge. SEO, or Search Engine Optimization, is the process of driving more & better traffic to your website through search engines, without using ads. When you search for a business near you, such as a “Dallas tree service,” Google uses more than 200 ranking factors to decide which businesses should be shown, and in what order. Knowing how to read, interpret, analyze, and influence those signals is at the heart of SEO. Over 600 people per month search for the exact words “Dallas tree service.” Over 350 search for “Dallas tree surgeons,” and another 20 search for “tree stump removal Dallas TX.” Add up every search that might lead to a tree care company in Dallas and you’re looking at several thousand searches per month. Most of these people click on the top result, and most of those clicks turn into phone calls. If your company invests in SEO and becomes the first result, that could translate to hundreds of thousands of dollars in new profit each month. Of course, you could also buy those clicks with a Google Ads campaign, but it would cost tens of thousands of dollars to get the same results. Long term costs, and costs per lead, will always be lower with SEO. How Do We Approach SEO for Tree Care Businesses? Of course, if you hire us to build your tree care company’s website, we can skip straight to the next step. Google likes websites that know what they’re talking about. That’s why we go into great detail about all aspects of your trade. We’ll publish pages that cover the best times of year to prune your juniper, blog posts that talk about the ideal fertilizer formulations for aspens, videos that break down the best mulch options, and a lot more. Unlike other SEO firms that work with tree care businesses, we’re happy to work with or without your input. Whether you want us to share your advice on R43 herbicide, or whether you’re busy running your business, our writers will make your company look like the tree care company to beat. On Google, links count as votes for your website, and some links matter more than others. That’s why we proactively build out only the best, most relevant links from industry websites, real estate blogs, local businesses, and more. Citations are very similar, except they serve a more specific function. Any profile that shows your company’s name, address and phone number is a citation, and Google checks that data against your Google local listing. If the data matches, that gives them more confidence that your information is real, up to date, and legitimate. If it doesn’t, Google will probably recommend another company instead. From About.me to Yelp, there are literally hundreds of citation sites to keep track of. Contractor Calls will build, maintain, and update those citations so you don’t have to. Often, sponsoring a little league team, joining an industry association, offering a scholarship, or joining the local chamber of commerce can have a massive impact on your SEO. Other times, it can’t. Our team will introduce you to the best SEO opportunities for your company throughout your campaign. We are also happy to evaluate the SEO impact of business opportunities that you find on your own. It’s hard to get reviews for any business that isn’t a restaurant, but they’re crucial to long-term success. Our team will help you identify the weak points in your review acquisition strategy, set up tools that make it easier to gather reviews, and help you deal with bad reviews. Our team knows the rules, the law, and what the competition is doing, so you won’t find a better partner to help with your reviews. SEO never sits still. Google is constantly changing their algorithm, your competitors are always changing, and your own business needs are always shifting. Our team works around flexible monthly plans to make sure that we’re always delivering the best updates for your needs. When your priorities change, so do ours. We also offer web design & SEO for sprinkler repair & installation specialists, landscapers, and more.